BAYTOWN, TX — When Jarvis Booker joined the TRiO Student Support Services program at Lee College, he was looking for an organization or activity to help beef up his resume. Instead, he found a new family and discovered new dreams on the way to earning this fall Associate of Applied Science degrees in Process Technology and Manufacturing Engineering Technology. 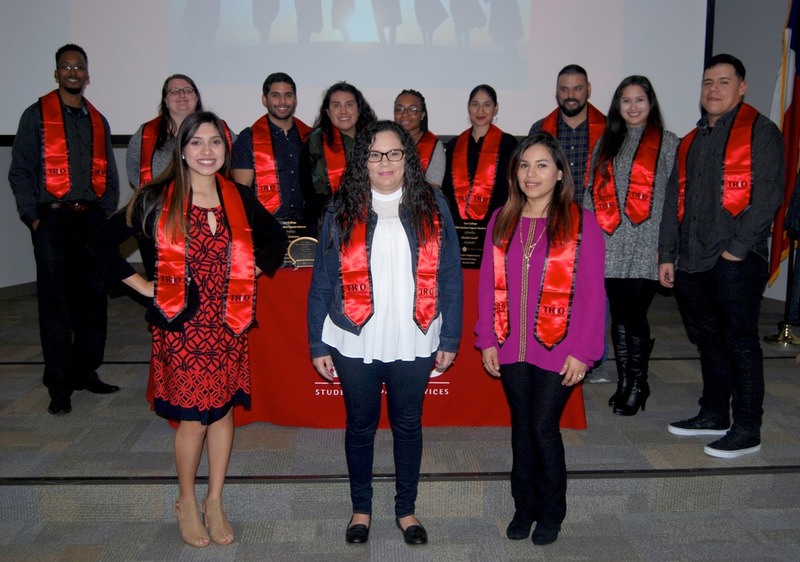 The TRiO Student Support Services program celebrated more than a dozen summer and fall 2016 graduates at a special ceremony held Thursday, Dec. 15, 2016, in the Rundell Hall Conference Center on campus. The program offers participants a variety of services to help them successfully complete their chosen associate degree or certificate. “It allowed me to enrich my character and develop determination, motivation and goals I never even had before,” said Booker, one of more than a dozen TRiO graduates from the summer and fall 2016 semesters honored at a special ceremony held Dec. 15, 2016, in the Rundell Hall Conference Center. Funded by the U.S. Department of Education, the TRiO Student Support Services program at Lee College offers a range of assistance to help low-income students, first-generation college students and students with disabilities progress through the academic pipeline — from financial aid, registration, graduation and transfer assistance, to individualized education plans, individual and group tutoring and student success workshops. At the ceremony, each graduate received a customized plaque in recognition of successful completion of their chosen associate degree or certificate program. 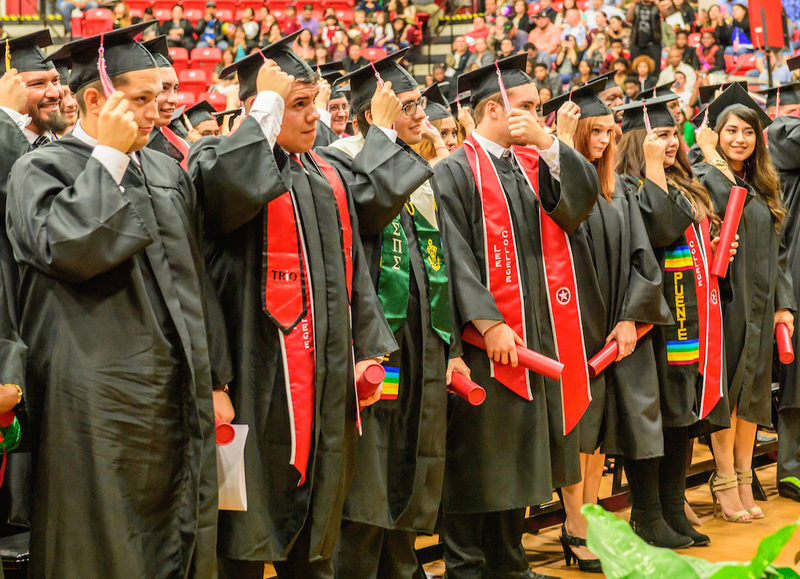 They also had the opportunity to award a special certificate to an instructor, staff member or loved one whose support made a difference during their time on campus. Treva Brown-Askey, a former TRiO participant and faculty member who chairs the Developmental Education Division at the college, also urged graduates to continue giving back to their community. Brittnie Broglin came to Student Support Services shortly after losing her mother, struggling to make it through her first semester at Lee College while also working two jobs. Now, after earning a second associate’s degree in E-Business Web Development, she feels ready to step into a bright new future in the information technology field. For more information about the TRiO Student Support Services at Lee College, contact 281.425.6500 or csebastien@lee.edu. Lee College Honors Program student Brenna Sallee (second from left) and the Student Honors Council came up with the idea to help students combat stress during Finals Week by bringing dogs from the Baytown Animal Shelter to campus. 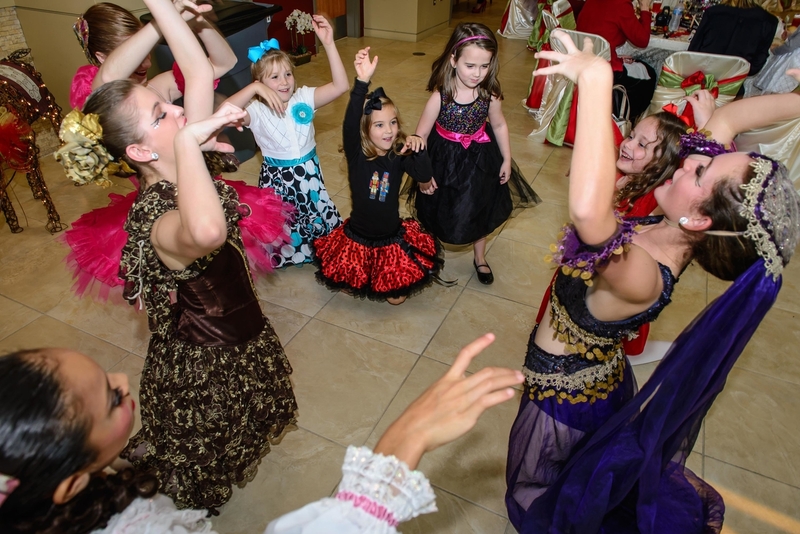 The pet therapy event is set for Dec. 12-13, 2016. 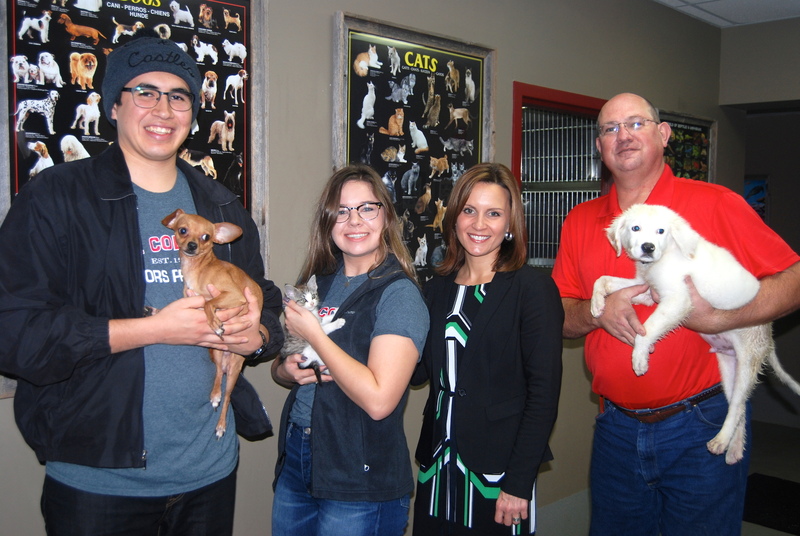 Also pictured at the shelter (l-r): Cesar Lozoya, Honors Program student; Georgeann Ward, Honors Program coordinator; and Kevin Cummings, manager of Animal Services for the city of Baytown. BAYTOWN, TX — Faced with end-of-semester essays and final exams as they enter the hectic holiday season, students in the Lee College Honors Program have partnered with the Baytown Animal Shelter to bring a little four-legged stress relief to campus during finals week. The Student Honors Council will host a pet therapy event with dogs from the shelter from 12:30-2 p.m., Monday and Tuesday, Dec. 12-13, in an enclosed area between John Britt Hall and the Advanced Technology Center. In addition to students, faculty and staff, members of the community are also welcome to pet, walk and even play fetch with the animals during their stay. “I thought it would be a good idea to reach out to the Baytown Animal Shelter to see if they would be willing to sponsor a pet therapy event at Lee College,” said Student Honors Council President Brenna Sallee, who got the idea after seeing that other colleges and universities have helped students combat feelings of stress and anxiety by bringing dogs and puppies to campus. “Their dogs would benefit from love and attention from the students at the college, and the students would benefit from getting outdoors to play with the animals,” she said. According to the American College Health Association, pet activity programs have provided students with a safe opportunity to perform diverse connections, provided a healthy outlet for positive touch and promoted relaxation. Of 400-600 students who participated in a pet program at the University of Chicago, 89-94 percent strongly agreed or agreed the event helped decrease their overall level of stress. Kevin Cummings, manager of Animal Services for the city of Baytown, jumped at the opportunity to showcase shelter animals at Lee College and raise awareness of adoption as an option. The shelter will also collect donations at the pet therapy event; toys are especially needed, and participants will be able to make their own toys at a creation station set up on site. Georgeann Ward, coordinator of the Honors Program, helped the students pull together campus and community resources, but praised their initiative in bringing the pet therapy event to their peers. “Creating student leaders is one of the goals of the Honors Program,” she said. For more information about the Lee College Honors Program or the pet therapy event during Finals Week, contact Ward at gward@lee.edu. BAYTOWN, TX – Lee College will recognize the achievements of more than 450 graduates at the 2016 Fall Commencement Ceremony to be held at 7 p.m., Friday, Dec. 16, in the Sports Arena on campus. 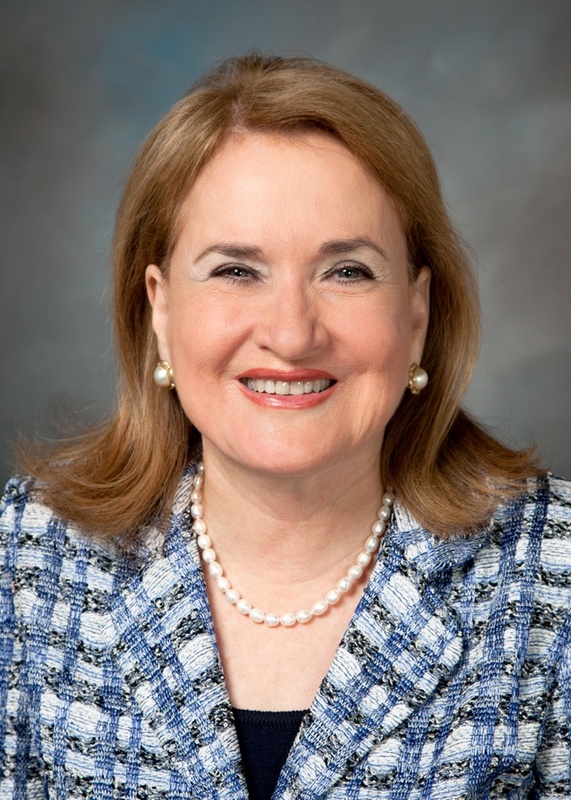 Texas State Sen. Sylvia R. Garcia will deliver the keynote address. A livestream of the ceremony will also be available online via the Lee College website at www.lee.edu. A native of the South Texas farming community of Palito Blanco, Garcia has represented Senate District 6 since 2013 and is chairwoman of the Texas Senate Hispanic Caucus. During the 84th Legislative Session, she passed 37 of her bills and served on the Education, Intergovernmental Relations, Transportation and Veterans Affairs & Military Installations committees. After protecting children and the elderly as a social worker early in her professional career, Garcia entered public service with the city of Houston as director and presiding judge of the Houston Municipal System for an unprecedented five terms under two mayors. There, she worked to make the city court system more effective and efficient for the community. Garcia was later elected to city controller, earning a reputation as the taxpayers’ watchdog, and in 2002 was the first Hispanic and first woman to be elected in her own right to the Harris County Commissioners Court. As a commissioner, she continued her advocacy for working families and the most vulnerable, while also pushing for new jobs and economic development. Garcia remains active in the Houston community, serving on more than 25 community boards and commissions including the San Jacinto Girl Scouts, which gave her the Board Award; Houston Hispanic Forum; American Leadership Forum; Battleship Texas; and the Museum of Fine Arts – Houston. She has been named “Humanitarian of the Year” by the National Conference of Communities and Justice and chosen as one of “Houston’s 25 Power People” by Inside Houston magazine. The eighth of 10 children, Garcia’s parents taught her from an early age the value of education and hard work. She is a graduate of Texas Women’s University, which awarded her the Board of Regents Woman of Distinction Award, and earned a Juris Doctor degree from the Thurgood Marshall School of Law at Texas Southern University.